vocabulary words, features (i.e. category group, function, parts, textures, location, etc.). 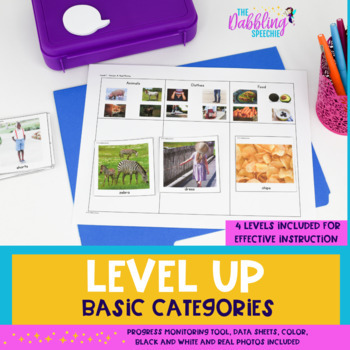 The activities are leveled, so you can get a baseline for what level your students are performing with understanding categories. The SLP can then start treatment at the students level and work towards new levels as students make progress. This resource is designed for speech pathologists, but can be used by General Education and Classroom Teachers. 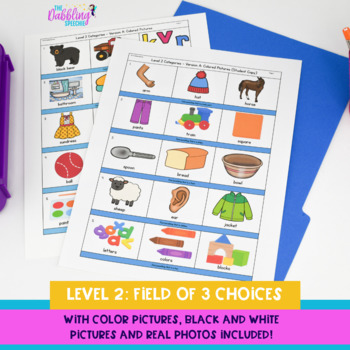 ⭐Find the Category Item in a Field of Three : Level 2 Categories - (Version A, Colored Pictures, Version B, Black and White Pictures and Version C, Real Photos). Each version has four different pages at this level. 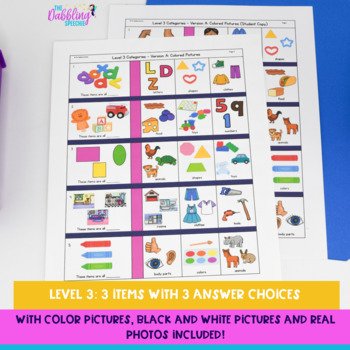 ⭐Three Stimulus Items with Three Visual Answer Choices: Level 3 Categories - (Version A, Colored Pictures, Version B, Black and White Pictures and Version C, Real Photos). Each version has two different pages at this level. 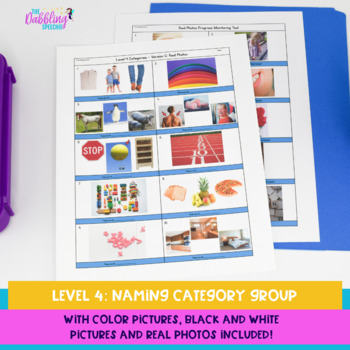 ⭐Three Stimulus Items with Naming the Category Group: Level 4 Categories - (Version A, Colored Pictures, Version B, Black and White Pictures and Version C, Real Photos). Each version has two different pages at this level. Need some category visual supports? You can try out these FREE Category visuals HERE. You can email me at feliceclark@thedabblingspeechie.com if you have any questions.